Otaki, where the Maori language was almost dead among young people 40 years ago, could become New Zealand’s first officially bilingual town. The town on the Kapiti Coast, north of Wellington, is leading the running to be given bilingual status, in a move being pushed by the Maori Party. Official status is likely to include bilingual street signs, and the possibility that businesses could have their invoices or signs printed in both languages. It would mark a big turnaround from the mid-1970s, when Victoria University professor Whatarangi Winiata found there were no Maori under 30 in Otaki who could speak te reo fluently. Now, just over half of Otaki-based Maori, and some non-Maori, are bilingual. The idea of celebrating a town’s bilingual status has come from a partnership between the Maori Party and Te Puni Kokiri, which advises the Government on Maori issues. 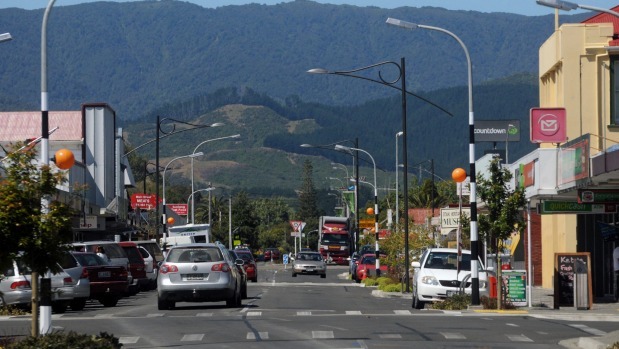 Kapiti Coast District Council, which includes Otaki, was keen to explore the idea, with mayor K Gurunathan saying towns needed to stick out these days to attract people. Otaki has a tertiary institution in Te Wananga O Raukawa, as well as two Maori immersion schools and two bilingual units within mainstream schools. The 2013 census showed 33.4 per cent of Otaki’s 5778 people identified as Maori, compared with 14.9 per cent nationally. It also showed 16.8 per cent of Otaki residents spoke te reo, compared with 3.7 per cent of all New Zealanders. Wananga academic provision executive director Hohaia Collier said te reo had became embedded in its students’ education, and was commonly spoken in the streets, and by shopkeepers. “They have a degree of comfort in listening to te reo, and responding. Sam Doyle, principal of Otaki-based immersion school Te Kura-a-Iwi o Whakatupuranga Rua Mano, said the process of becoming officially bilingual formalised what was already going on with the town’s young people. “It’s kind of hard not to be affected by it, even for those kids in mainstream schools. United Video Otaki co-owner Geoff Carre, who is from Britain, said he supported the move, and tried to greet and farewell his customers in te reo as much as possible. ​Maori Party co-leader Te Ururoa Flavell said discussions had been held with Otaki and Rotorua about becoming bilingual, and Wairoa also had a similar goal. “This is something that is attainable – Otaki could realise what it is like to be a bilingual town. “There is potential to partner with government, local government, community and Maori to trial a bilingual approach.